I am writing regarding your request for the obituary of Thomas Copeland. Unfortunately, the newspapers did not carry the news of his death. I checked the Malden Merit, Twice-a-Week Dunklin Democrat, and Farmington News. I’m sorry we came up empty handed on your request. Let me know if you have any questions. You can view Tom Copeland’s death certificate HERE, which lists his parents as George Copeland and Mary Lawson. 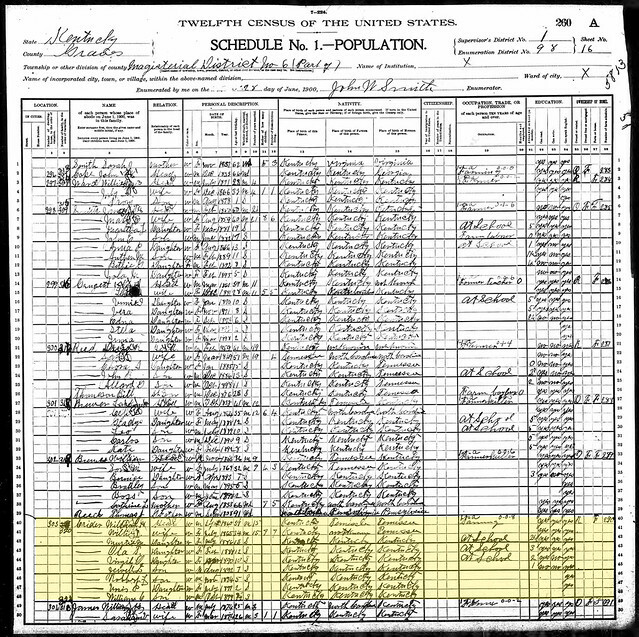 I am sure that George Copeland was his father, but I have doubts about Mary Lawson, considering that George’s wife on both the 1870 and 1880 Census was named “Sarah.” I believe there is a connection to the Lawson family but it would have been through George’s first wife, who was not the mother of Tom Copeland. My grandfather, Bill a.k.a. “Uncle Delvie”, told me that Tom’s mother was named Charlotte Eve Kingsley. I haven’t found anyone by that name living in Dunklin County around the time that George was there, but I’m not 100% sure that he married “Sarah” (the woman who must be Tom’s mother) in Dunklin County. This entry was posted in Copeland, Obituaries and tagged copeland, obituaries, obituary request, State HIstorical Society of Missouri, Thomas Copeland, Tom Copeland on November 23, 2013 by Kelli Copeland Wilson. ESCONDIDO – Ross Roe, 56, died Thursday, Jan. 27, 2005,at his home. He was born June 24, 1948, in Chelsea, Mass. He worked at Tri-City Fence in Escondido. At one time he was the owner of Ironrose Welding in Ramona. Mr. Roe is preceded in death by his parents, William and Eileen Roe. He is survived by his wife, Joan Roe of Escondido; sons Jason Roe of Leeds, Utah, and Jake Roe of Ramona; stepsons Quill Pena and Joe Prescott, both of Ramona, Ryan Hester of Riverside, and Michael Cole and Robert Rowe, both of Escondido; stepdaughter Amy Hester of Escondido; sisters Sharon Bryant and Jolien Lawerance, both of Huntsville, Alaska [should say Arkansas]; and five grandchildren. A memorial service is scheduled for 2 p.m. Saturday, Feb. 5, at Bonham Bros. & Stewart Mortuary in Ramona. Bonham Bros. & Stewart Mortuary is handling arrangements. This entry was posted in Copeland, Crider, Obituaries and tagged Bill Copeland, copeland, crider, EIleen Schena, Myrtle Crider, obituaries, Roe, Ross Roe, Tom Copeland, William Delvie Copeland on October 31, 2013 by Kelli Copeland Wilson. FEEDING HILLS – Michael J. Wollmershauser of Feeding Hills, MA passed away peacefully in the arms of his loving wife Joan and his children holding his hands on December 8, 2002 after a long five-year battle with cancer. Mike was employed since 1992 for the Hampden County Sheriff’s Department as a Fitness Trainer/Correctional Officer. Michael was known by many as “Master Mike”. He was an 8th degree black belt in Hapkido, a Korean Martial Art. He was the 3rd highest ranked in the world in this system, holding the esteemed honor of Grandmaster. He was also known as the “Master of Hand Techniques”. He was president of the American Hapkido Association since 1981 to present. He was the owner of the American Hapkido & World Olympic Taekwondo Center in Feeding Hills, MA. He previously owned the J. Parks Karate Studio in Springfield and also taught at the YMCA in Springfield, Janar Gymnastic in Wilbraham, MA, and Fitness First in Feeding Hills, MA as a Hapkido/Taekwondo/Tai Chi instructor. He was also an adjunct professor at Springfield College for 12 years and at Western New England College for six years until joining the Sheriff’s Department in 1992. Prior to studying and teaching martial arts, Mike was employed by McDonnell Douglas Aircraft in St. Louis, MO as an aircraft electrician, and worked on the Gemini Space Program and on jet engines. Mike traveled extensively to Korea to train in Hapkido and also traveled to the martial art schools under his direction in the United States, Europe, India, Australia and many other countries. He passed on his knowledge of Hapkido to thousands and at the time of his passing had promoted 247 black belts in Hapkido and Taekwondo. Mike attributed his ability to fight cancer to the martial arts and to the love and prayers of his family and friends. Mike was an avid chess player who won the McDonnell Douglas World Championship in the 1960s. He was also an accomplished oil painter. Michael is survived by a loving family, his wife, Joan (Shea) Wollmershauser; his mother, Juanita (Grimes) Wollmershauser of St. Louis, MO; his six children, Jonathan W., Michelle J. and Mikala J. Wollmershauser, all of Feeding Hills, Mia Wollmershauser-Wenz of West Springfield, and Steven and Jeffrey Wollmershauser. He leaves four brothers, Ronald B., Arthur G. and David P., all of St. Louis, MO, and Craig D. Wollmershauser of Winters, CA; and one grandchild, Khylyn Wenz. Funeral services will be held Saturday, Dec. 14 from the Colonial Forastiere Funeral Home of Agawam at 10:30 a.m. with a Mass in Sacred Heart Church at 12 noon. Burial in Gate of Heaven Cemetery, Springfield. Visiting hours Friday, 2-5 & 7-9 p.m. He will be sadly missed by all whose lives he touched. In lieu of flowers contributions can be made to the Michael Wollmershauser Memorial Fund c/o Joan Wollmershauser, 157 Cambridge St., Feeding Hills, 01030. This entry was posted in Bunting, Copeland, Grimes and tagged Bunting, clara bunting, copeland, Grimes, imogene copeland, Juanita Grimes, Michael Wollmershauser, obituaries, Tom Copeland, Wollmershauser on October 31, 2013 by Kelli Copeland Wilson. WILLIAM COPELAND, 79, of Drummonds, owner of a television repair business, died Saturday at his home. Services will be at 1 p.m. today at Munford (Tenn.) Funeral Home with burial in Poplar Grove Cemetery in Drummonds. He was a member of Fellowship Baptist Church in Quito, Tenn., and was a World War II and Korean War Navy veteran. Mr. Copeland, the husband of Mabel Elizabeth Massey Copeland, also leaves three daughters, Mona Louise Laffoon of Lynnhaven, Fla., Marcia Lorraine Priess of Millington and Sheri Denise Holloway of Davison, Mich.; four sons, James Leroy Dishaw of Fort Worth, Texas, Dale Copeland of Norfolk, Va., Brian Copeland of Keene, N.H., and Darrell Copeland of Concord, Mass., 11 grandchildren and three great-grandchildren. This entry was posted in Copeland, Crider, Obituaries and tagged copeland, crider, Myrtle Crider, obituaries, Tom Copeland, William Delvie Copeland on October 31, 2013 by Kelli Copeland Wilson. WEAVER, Dorothy B. – Of Flint, age 84, died Sunday, December 22, 1996 at Briarwood Manor. Funeral services will be held 11AM Thursday, December 26, 1996 at the Brown Funeral Home, 1616 Davison Rd., Rev. Grant H. Wessel officiating. Burial at Flint Memorial Park. Mrs. Weaver will lie in state at the funeral home from 2-4 and 6-8pm on Tuesday and Wednesday. Mrs. Weaver was born April 8, 1912 in Arbyrd, MO. She married Dewey L. Weaver on October 21, 1934 in Piggott, AK. Mrs. Weaver was employed at the Robert Hall Clothing Store retiring in 1975 after 25 years of service. Surviving are: Husband Dewey L. Weaver of Flint; son, Jerry Weaver and wife Patricia of Flint; daughter, Judith Steck and husband Walter of Swartz Creek; 8 grandchildren, Jerry Weaver Jr., Teresa Kapture, Lisa Sams, David Lindensmith Jr., Karen White, Sherry Parsons, Tommy Weaver Jr. and Timmy Weaver; 16 great-grandchildren; sister, Donna Waltrip of Flint; brother, William D. Copeland and wife Mabel of Munford, TN; many nieces and nephews. Mrs. Weaver was preceded in death by her son, Tommy Weaver in 1967. Our sincere thanks to the caretakers of Briarwood Manor Nursing Home for the love and devotion shown to Dorothy. This entry was posted in Copeland, Crider, Obituaries and tagged copeland, crider, dorothy beatrice copeland weaver, Myrtle Crider, obituaries, Tom Copeland, weaver on October 31, 2013 by Kelli Copeland Wilson. WALTRIP, Donna Genevieve – Age 73, of Flint, died Thursday, July 13, 2000 at her home. A Funeral service will be held at 1PM Monday, July 17, 2000 at Brown Funeral Home, 1616 Davison Road with Rev. Leo Haring officiating. Burial will follow at Flint Memorial Park. Visitation will be held from 7-9PM Saturday and 2-4 and 6-8PM Sunday. Memorial contributions may be made to the American Lung Association. Ms. Waltrip was born April 25, 1927 in Leachville, Arkansas, the daughter of Thomas and Myrtle (Crider) Copeland. She retired from A.C. Spark Plug in 1980 after 33 years of service. Ms. Waltrip was a member of the Fraternal Order of Eagles and the Fraternal Order of the Police. Surviving are: daughter, Shelley Sue Gray and fiance Jeff Mabrey; granddaughter, Jeanette Menzer; great-grandchildren, Steven Menzer and Kelli Rene Menzer; brother, William D. Copeland and wife Mabel; nephew, Jerry Weaver and wife Patricia; nieces, Judy Steck and husband Walter, Sheri Holloway and husband Norman; special friends, Sonny and Bea, Sophie and Bev, James and Shirley. This entry was posted in Copeland, Crider, Obituaries and tagged copeland, crider, donna genevieve copeland, Myrtle Crider, obituaries, Tom Copeland, waltrip on October 31, 2013 by Kelli Copeland Wilson. 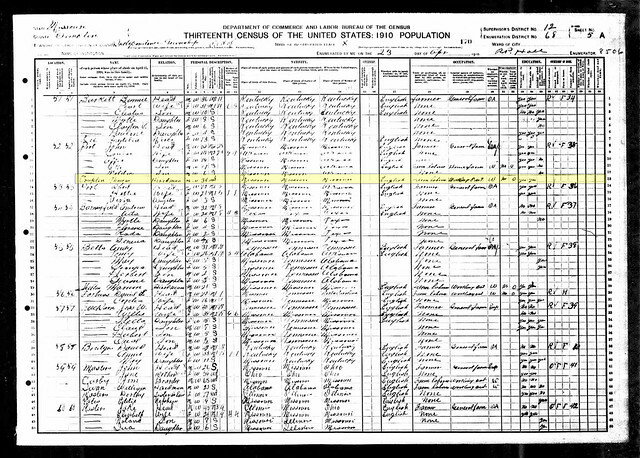 Since my last post focused on the US Federal Census records that we have for Tom Copeland (1876-1948), I thought it might be nice to look at the census records we have for his wife, Myrtle (Crider) Copeland. Myrtle was born in 1886, so she is not on the 1880 US Federal Census. As I mentioned in my post about Tom, there is no US Federal Census for 1890 because most of the records were destroyed by a fire in 1921. Therefore, the first US Federal Census we have for Myrtle is for the year 1900. In 1900, Myrtle was living in Magesterial District 06, Graves County, Kentucky. 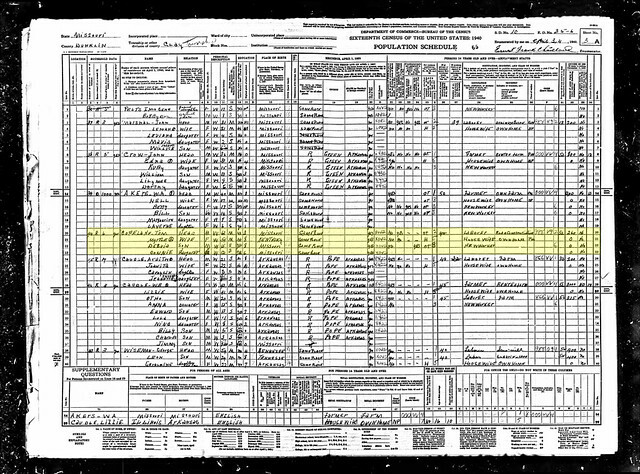 The US Federal Census record shows her parents are “William H” (William Herbert “Hub” Crider), age 39; and “Willie J” (Willie J. Killebrew), age 34, both born in Kentucky. Myrtle is called “Myrtie M”, she is 18 years old (born in Kentucky), and the oldest of many siblings: a sister “Ola S”, age 12; another sister (who is actually a brother) “Virgil O”, age 10; a brother “Jewell L”, age 7; another brother “Robby F”, age 5; a sister “Unis P”, age 2; and a baby brother “William C”, age 8 months. According to this record she is “At School” and she can read, write, and speak English. She is still single. Ten years pass and the 1910 US Federal Census finds our Myrtle living in Independence, Dunklin County, Missouri. Sound familiar? It should! Tom Copeland was also living in Independence in 1910. 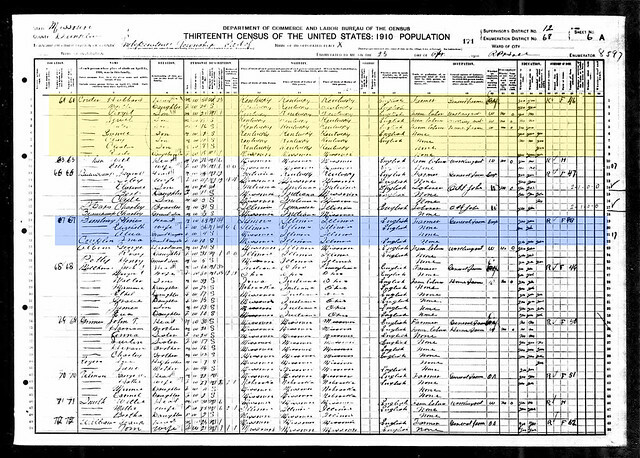 In fact, as you can see from this record, his daughter “Ima Couplin” (Imogene) was living just a few houses away from Myrtle and her family at the home of her grandparents, the Buntings (highlighted in blue). Because of his marriage to Clara Bunting (who by 1910 was institutionalized), Tom may have lived with the Buntings when the Criders arrived in town or, at the very least, he would have visited his daughter there occasionally. We can see that his proximity to the Crider household made possible his future marriage to Myrtle, the results of which led to the existence of many of us! Sometimes, when I see connections like this, I realize how lucky I am to be alive. One wrong move by my ancestors and I wouldn’t be here! Back to the record: Myrtle is now 24 years old and has gained some siblings, but lost her mother. Her father, “Hubbard Crider”, age 50, is a widower with many mouths to feed: Myrtle, age 24; “Jewel”, age 18; “Lester”, age 16; “Eunice”, age 12; “Clay”, age 10; and “Cleatus”, age 8. There is also a “Rado Crider” listed, who is Myrtle’s sister-in-law, wife of her brother Virgil. Although she was 24, Myrtle was still single, and not working — she was most likely caring for her younger siblings in the absence of their mother. From here on out the census records available for Myrtle Crider are the ones that I covered in my post about Tom Copeland. In 1920 the US Federal Census shows Myrtle is living with her husband, Tom Copeland, in Neal, Mississippi County, Arkansas. She is 34 years old, born in Kentucky (and both parents were born in Kentucky, as well). She is the mother of two children: “Dortha B” (Dorothy), age 8; and “Othar D” (Dewey Otho), age 6. Since Dorothy is her oldest child, we can guess that she met and married Tom Copeland sometime between 1910, when they were listed separately on the census record, and 1912, when Dorothy was born (we know the date of their marriage, but that will have to wait for another post). Moving on to 1930, the US Federal Census for that year tells us that Myrtle is 43 years old. She first married at the age of 23 (this is probably true, since she married in 1910). She did not attend school within the last year, but she can read and write. She and both of her parents were born in Kentucky. Myrtle now has four children: “Dorthy” (Dorothy), age 18; “Dewey”, age 16; “Delvie” (William Delvie a.k.a. “Bill”), age 6; and Donnie (“Donna”), age 3 months. I don’t know if you noticed, but I see that there is a big gap between Bill and his next oldest sibling, Dewey (10 years!). From this record we might wonder if there was at least one other child born between them, possibly more. But, what happened to this child(ren)? These are the kinds of things that one can only discover by close examination of the records. Now that we suspect there was another child, we will know to look for him or her in another source. Losing a child (and a sibling) would have been devastating for the Copeland family, though sadly not uncommon during the early 20th Century. The last census record we have for Myrtle is the 1940 US Federal Census. As we learned in our analysis of Tom Copeland’s census records, the family returned to Missouri sometime between 1930 and 1935. They now reside in Clay, Dunklin County, Missouri. The census record indicates that Myrtle provided the information to the enumerator, so we can trust it, to some degree (mistakes could still be made!). Myrtle is 54 years old, and a “House Wife” in her “Own Home.” She received 8 years of schooling, which is 5 more than her husband, Tom. She has two of her children still living with her: a son, “Delvie” (William Delvie a.k.a. “Bill”), age 15; and a daughter, “Donnie” (Donna), age 12. Wait a minute — wasn’t Donna 3 months old at the time of the last census? Yes, she was, but we can trust that if anyone was wrong it was the enumerator or the person supplying the information in the last census record, since we would hope that Myrtle knew the ages of her own children (childbirth isn’t something one easily forgets). Well, that brings us to the end of the available census records for Myrtle. Since she didn’t pass away until 1967 she is listed on the 1950 and 1960 US Federal Censuses. But, the public won’t have access to those for a long time. If we want to know more about the next few decades of Myrtle’s life, we’ll have to look elsewhere! This entry was posted in Census, Copeland, Crider and tagged census, clara bunting, copeland, crider, imogene copeland, missing copeland child, Myrtle Crider, Tom Copeland on October 29, 2013 by Kelli Copeland Wilson. Here in the United States, the Federal government usually does a census every 10 years. The first US Federal Census was taken in 1790, when the population of the United States was around 3 million people. The most recent US Federal Census took place in 2010, with a population now over 308 million people. Wow! From 1790 until 1850 the US Federal Census listed only the Head of Household, and the number of people in his or her home. Starting in 1850 all members of the household were included, and over the years additional categories have been added. Right now I’m going to share with you the US Federal Census records that we have for our ancestor, Thomas Copeland (a.k.a. “Tom”). Tom Copeland is the father of Dorothy, Dewey, Delmer, William Delvie, and Donna Copeland. Many of you are descended from one of these siblings. While these records do not comprise the entirety of the information we have about Tom Copeland, they do help us to tell a little about the course of events in his life — a sort of mini-biography based on snapshots taken every 10 years. Tom was born in 1876, so the first time he appears is on the 1880 US Federal Census for Cotton Hill, Dunklin County, Missouri. From this record we learn that Tom is four years old and was born in Missouri. 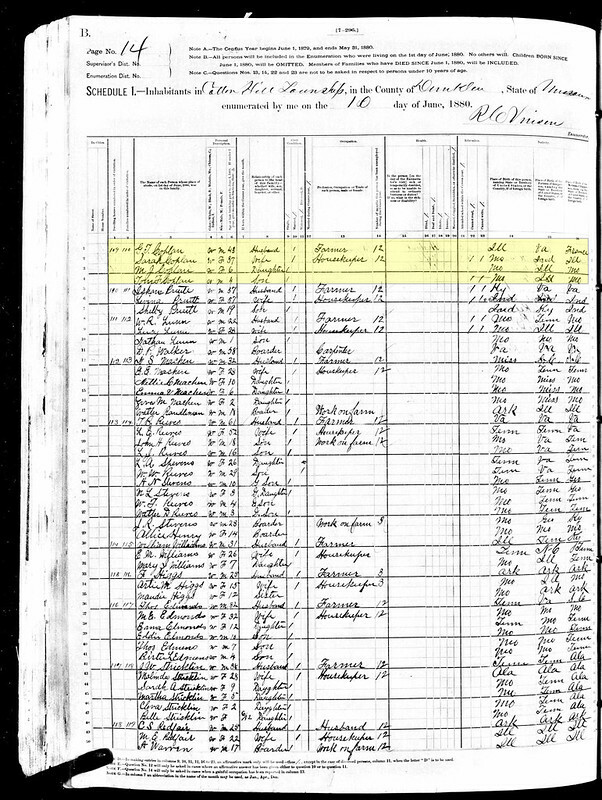 The names of his parents (he is listed as “son”) are “G.T” and “Sarah”, and he has a sister named “M.J.” We also learn that his father was born in Illinois and his mother in Missouri, which matches the birthplaces of the parents listed for him on this census record. You can click on each image to open a larger version in a new browser window. Tom and his family are highlighted. 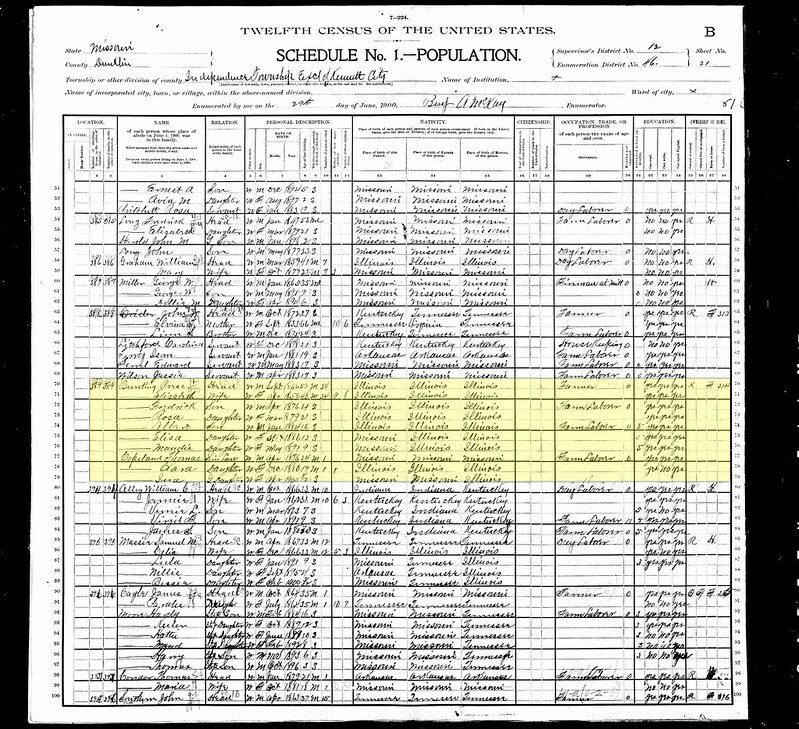 The next Federal Census year is 1910, in which we find Tom Copeland still living in Independence, Dunklin County, Missouri, working as a “hired man” at the home of John and Louisa Pool. He is listed as being 34 years old, and “widowed,” although this is a bit inaccurate because we know that Tom’s wife, Clara, was still alive in 1910, though sadly institutionalized. The census also notes that he is able to read and write (good for you, Tom!) and that he and both of his parents were born in Missouri. The interesting thing about census records is that it wasn’t until 1940 that enumerators noted who was providing the information to the census-taker. So, one will often find discrepancies in dates and places of birth, and even names, between one census and another — this can be attributed to many causes, but the number one reason is probably that the person supplying the information was not a member of the family (they could have been a neighbor, or a visitor). Zoom ahead 10 years and we find our Tom living in Neal, Mississippi County, Arkansas. Wait a minute, how did he get there? This is a question that census records can’t answer. People move, usually to better their situation. We could speculate that Tom left Dunklin County to pursue an opportunity that he couldn’t refuse, whatever that might have been. 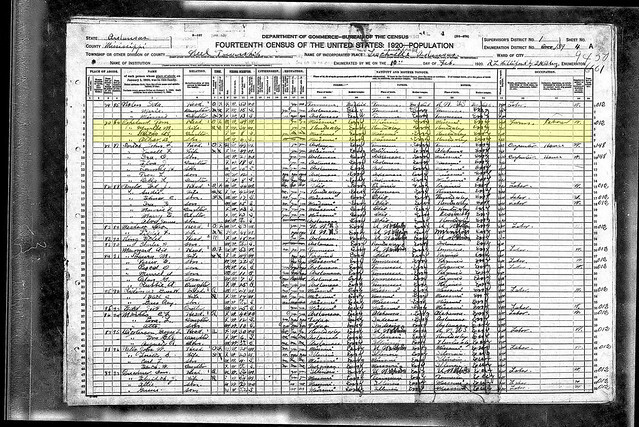 From the 1920 US Federal Census, we learn that Tom Copeland has married again, and his wife’s name is “Myrtle M” (we know this is Myrtle Crider from other sources). He also has a daughter named “Dartha B” (Dorothy), age 8; and a son “Othar D” (Dewey Otho), age 6. The Census indicates that Tom is 49 years old, owns his home, and is a farm laborer. His place of birth is listed as Missouri, his father’s as Illinois, and his mother’s as Missouri. Another ten years passes for Tom and the 1930 US Federal Census indicates that he is still living in Neal, Mississippi, Arkansas. He is still married to Myrtle, and now has four children: “Dorthy” (Dorothy), age 18; Dewey, age 16; “Delvie” (William Delvie, a.k.a. “Bill”), age 6; and “Donnie” (Donna), age 3 months. 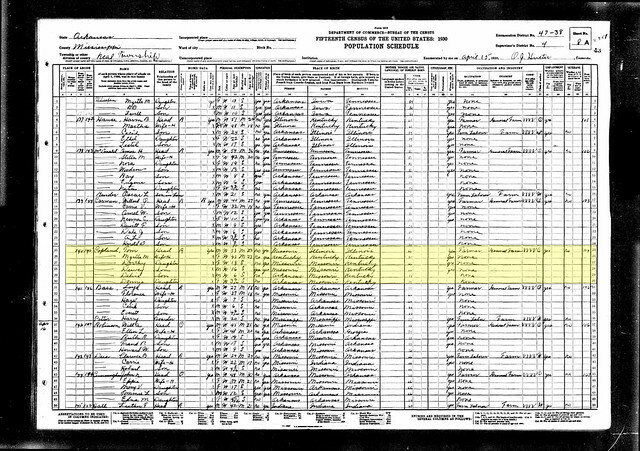 This census record indicates that Tom is 53 years old, born in Missouri, and both of his parents were born in Illinois. He lives on a farm and works as a “Farmer” (go figure!). Our final census record for Tom is the 1940 US Federal Census. According to this record, Tom is once again living in Dunklin County, this time in the town of Clay. He is still married to Myrtle, and the census indicates that she is the one who has supplied the information about her family to the enumerator. That doesn’t necessarily mean that everything is accurate, but there is a better chance of accuracy. Tom is now 62 years old (born in Missouri), and working as a “Laborer” in “Road Construction.” His highest level of education completed was three years of school (or 3rd grade?). He was living in the “Same House” five years prior (1 Apr 1935) so he must have moved from Neal, Arkansas, back to Dunklin County sometime between 1930 and 1935. He still has two children living with him, “Delvie” (William Delvie a.k.a. “Bill”), age 15; and “Donnie” (Donna), age 12. We know from other sources that Tom Copeland died in 1948, so he wouldn’t have appeared on the 1950 US Federal Census even if we had access to it (we’ll have to wait until 2022 for it to be released to the public). I hope you enjoyed my mini-biography of Tom Copeland, which is the result of close analysis of the six US Federal Census records we have for him. Though a brief glimpse every ten years tells us very little about a person’s life, it gives us just enough to keep us interested and coming back for more. This entry was posted in Census, Copeland and tagged census records, Dewey Copeland, Donna Copeland, Dorothy Copeland, Myrtle Crider, Tom Copeland, William Delvie Copeland on October 28, 2013 by Kelli Copeland Wilson.